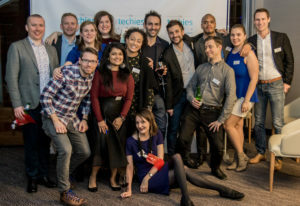 In its third successful year, the techies is all about recognising and celebrating the best in the UK tech sector, whether it is a tech product, project, team or individual. The techies 2018 saw great traction from some of the leading technology companies such as Box, GoCardless, Luminance, Expedia, Yodel and the like. We also saw some returning techies entries such as Dataiku, RNF Digital, Satchel etc which echos how much the techies awards is valued by our tech audience. Similar to last year, we received numerous entries from non-tech companies as well who had great success stories to share about innovating with technology, which included Ticketmaster, Yodel Delivery Network, Property Partner, MytripCar, Divido to name just a few. This further reiterates the significance of the techies awards amongst non-tech companies. 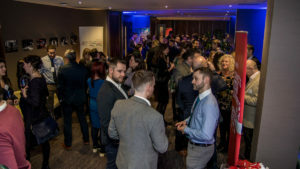 The techies 2018 awards party was held at the 5-star M by Montcalm Hotel in Shoreditch, London on 22nd February. The event kicked off with a welcome drinks reception accompanied by our DJ who ensured the music kept flowing as much as the conversations did. Our partners, Jobbio, also had a huge presence at the event where they held a competition featuring Willy Wonka inspired golden envelopes. The envelopes were stuck to the bottom of the chairs in the meeting room, and added to the fun of the evening when the CEO of Jobbio, Stephen Quinn, announced that one of them contained a ticket to a full Jobbio subscription worth £10k. After a chaotic treasure hunting session, Giles Bones of MyTripCar found the real treasure – double-win for them on the night who also won the techies 2018 award for the Consumer StartUp of the Year category. Overall, it was a fun-filled and successful night with all the winners and shortlisted nominees equally enjoying the company of their tech peers from across the UK.